The Sudan Mini-Rigs Unit was formed in Wayne County by the Wayne Shrine Club in 1992. The Unit was created during past Potentate Illustrious Sir Arnold Brown's term in office, and consisted of thirty-five (35) charter members. The identical Red "Mini Tractor Truck Rigs" were purchased by members at a reported cost of $1800.00 each. Initially, there were twelve (12) trucks in the Unit. The Unit's first parade was in November 1992 at the Sudan Shriner's Fall Ceremonial in Lumberton, NC. The Unit performed in six parades in its first year. In 1993, they made thier first donation to the Shriners Hospital for Children in the amount of $650.00. During our many years in operation, the Sudan Mini-Rigs have grown to forty-four members, with eighteen Mini-Rig Trucks and seven Recovery Vehicles. The parade unit averages over 30 parades/performances per year. All of the Trucks and Recovery vehicles are individually owned and maintained. 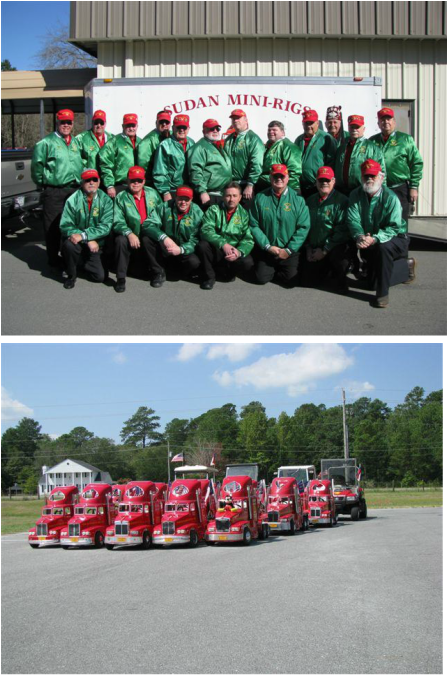 Twenty two different Nobles have proudly served as "Captain of the Unit" parading and performing in over 700 events while raising over $215,000.00 for the Shriner's Hospitals. A proud Unit in Sudan with a proud tradition.